Ambroise Vollard, Paris (before 1914). Acquired by the present owner in 1993. J. Badout, Renoir, ses Amis, ses Modèles, Paris, 1949 (illustrated, p. 55). F. Daulte, Auguste Renoir, Catalogue raisonné de l'oeuvre peint, vol I, Figures 1860-1890, Lausanne, 1971, no. 346 (illustrated). Paris, Galerie Bernheim-Jeune, Renoir Portraitiste, June-July 1938, no. 47. Paris, Galerie des Beaux-Arts, Renoir, 10-27 June 1954, no. 22. 'In Renoir's figure painting, portraiture deserves a special place unto itself. For no other artist has looked so deeply into his sitter's soul, nor captured its essence with such economy.' These words, written by Georges Rivière in 1925 in an article on Renoir, highlight the importance that Rivière placed on the role of portraiture in Renoir's career. Indeed, Rivière was actively involved in generating custom for his friend during the lean years of the late 1870s. Rivière, who published his biography of the artist, Renoir et ses amis, in 1921, was amongst Renoir's tight band of friends in the 1870s. Together they frequented the Moulin de la Galette in Montmartre and visited the celebrated salon of Madame Charpentier. Naturally gregarious, Rivière was the ideal foil to Renoir's awkwardness in society, and his friend writes touchingly of visiting a salon in the aftermath of the critical ridicule heaped on the second Impressionist show. 'Although Renoir did not like society gatherings, he enjoyed going to Madame Charpentier's. There he was among intelligent people where, thanks to the tact and grace of the mistress, there was no sign of aloofness or tedium. The painter felt supported and encouraged by the welcome of the friends he met there and that helped convince him that he was not as abandoned by God and men as the critics made out in their reviews of the exhibition at the rue Le Peletier' (quoted in N. Wadly, ed., Renoir, A Retrospective, New York, 1987, p. 117). 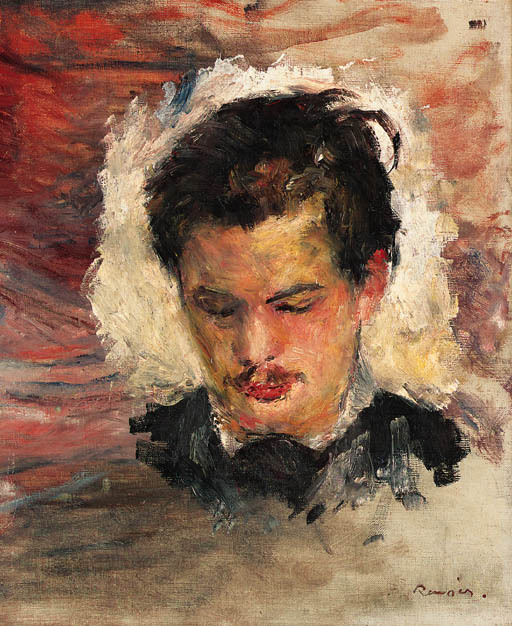 Aside from the present work, Renoir used Rivière as a sitter in other important works, including the single figure portrait in the collection of the National Gallery of Art in Washington (Daulte 259) and, most famously, in Dans l'atelier de la rue Saint-Georges (D. 188) of 1876, where Rivière, placed to the right of Pissarro, is given pride of place amongst Renoir's circle of intimates.